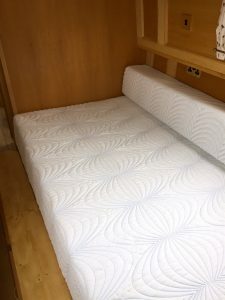 A boat mattress replacement is not as simple as it sounds. A search online will give you thousands of results with questions, forum posts, what not to use and the multiple strategies others employ. When it comes to thickness, first determine the thickness you have to work with. Depending on the height from the ground, there can be limits to how thick you can go. The same foam at both four inches and five inches feels completely different. In addition, the thinner the foam, the faster you will feel the underlying layer. Up to a point, thicker is better. Take the weight of the occupants of the boat into consideration. The heavier person will sink into the foam and feel the underlying layer. This leads to a very uncomfortable night of sleep. Since the thickness levels are limited on a boat, the best approach is to look at two layers, one harder and the upper layer softer for comfort. Use dryfast foam for its water resistance. Cushions are dual purpose. You can either sleep on them or sit on them. Unfortunately, this comes with a bit of tradeoff. When sitting, the weight is concentrated on one spot, while sleeping spreads the weight across the entire surface. Strike a balance between firmness (for sitting) and softness (for sleeping. The Foam Factory specializes in foam products suitable for boat foam and other marine applications.